Tom Côté, who lives in Limestone, comes from a long line of talented wood carvers. His great-great grandfather, Jean Baptiste Côté, was a famous artist and carver in Québec during the 1800s. His father, Lenwood Côté, also was a wood carver and his mother, Rena Côté, showed him how to use a jackknife when he was 12-years-old. He studied wood sculpting in Saint-Jean Port Joli, Québec. His roots go deep in the French and Acadian heritage. 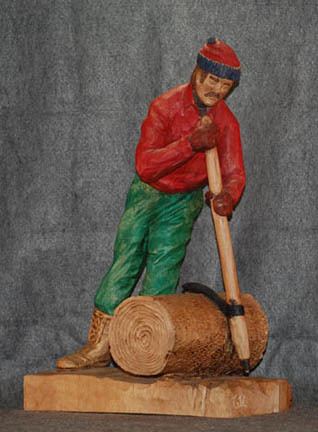 Côté has won many awards for his carvings in competitions throughout New England and Eastern Canada. Côté uses hand tools exclusively, no motorized tools. He works with mallets, chisels, and knives. Tom Côté has been an art teacher for more than 30 years, teaching students from age 5 to 90 in many types of visual arts, but states that his main art form is wood sculpting. The Maine Arts Commission has recognized him as a “Master Carver” and has awarded him many teaching apprenticeships throughout the years. He has carvings in private collections all over the world.